The HTC Thunderbolt was originally supposed to receive its Ice Cream Sandwich (Android 4.0) update by the end of August. As we all know, that didn’t exactly happen. So here we are, approaching the end of 2012 and the update is still nowhere in sight. HTC is well aware that they missed their deadline and assure us that they are still working on it, however, they have yet to give us any sort of new time frame to get excited over. All we have heard recently, is that they are working on connectivity issues with Verizon and that they’ll share info as they work through them. 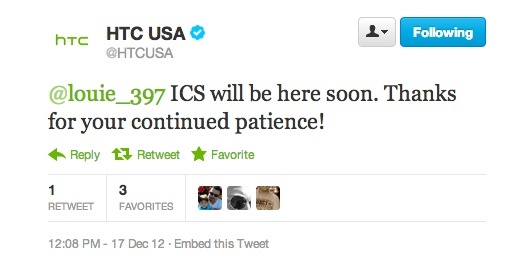 Well, today, they changed their tone a bit and are now saying that the update “will be here soon.” “Soon” can obviously mean 6 months from now for all we know, but at this point, I don’t think they wouldn’t say “soon” if they didn’t think that they had moved past their issues and are steps away from approving the update. Unfortunately for Thunderbolt owners, your two years with the device is about up and you are probably about ready to upgrade to something else. It would have been nice if you could have spent your last 6 or 7 months with proper software rather than dealing with the frustrations of Gingerbread.